A few weeks ago I lost my passport. Talk about a meltdown...that single booklet of assorted papers was synonymous with a sacred text, a relationship as personal as that of a best friend, and losing it was mourning a death. Three years of documentation of treks across the globe — Tahiti, Bali, Australia, New Zealand, Sri Lanka, Samoa, Japan, Hong Kong and more — a treasure I planned to save for my children someday, gone in an instant. But with the flood of tears came a washing away of attachment, and the movement forward towards letting go and a focus on the next big adventure. Enter an old friend inviting a new escape. My beautiful friend Karina Petroni has traveled the world through her professional surfing career since she was 12 years old, and in 2010 found nostalgia in the Bahamas in it's parallels to her native Panama. She has lived there ever since, and in the most idealistic of timing, encouraged me to catch a flight down to experience the wonder of her Caribbean playground. Washing off winter in the Bahamas is like stepping into a dream. Our first stop, Gregory Town, Eleuthera, home of some of the sweetest pineapples I've ever tasted and beaches that are nothing short of pristine. We found beautiful waves at both Surfer's beach and Holiday beach via the Glass Window Bridge, a unique collision of the stunning contrast between the rich, dark blues of the churning Atlantic and the serene, aqua hues of the Caribbean. While the news reported blizzards and endless snowfall in the northeast, we spent our days eating spicy, fresh conch salad from roadside food stalls and exploring secret caves and blue hole lagoons. 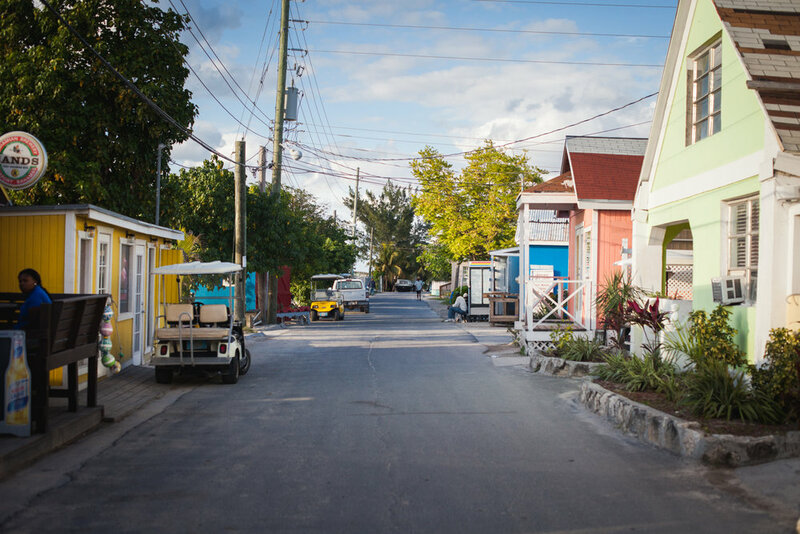 Our accommodation was on nearby Harbour Island, a quintessentially Caribbean locale with brilliant colored beach bungalows, electric turquoise ocean views, pink sand beaches, and warm, charismatic locals. As I look back on the most spectacular of moments from my time in the Bahamas, from surfing to hiking to diving and exploring, there's one element that rings common across the board -- always moving forward. When the beautiful Bahamian Goddess at customs pressed the first stamp into my freshly printed passport, I moved forward in a way that allowed me to never forget that no matter what, we can never go back, and to let go of the past is to set ourselves free.